A British woman was ordered to “cover up” or be kicked off her flight in the UK city of Birmingham, which has a 25% Muslim population. “Flying from Bham to Tenerife, Thomas Cook told me that they were going to remove me from the flight if I didn’t “cover up” as I was “causing offence” and was “inappropriate”. They had 4 flight staff around me to get my luggage to take me off the plane,” tweeted Emily O’Connor. 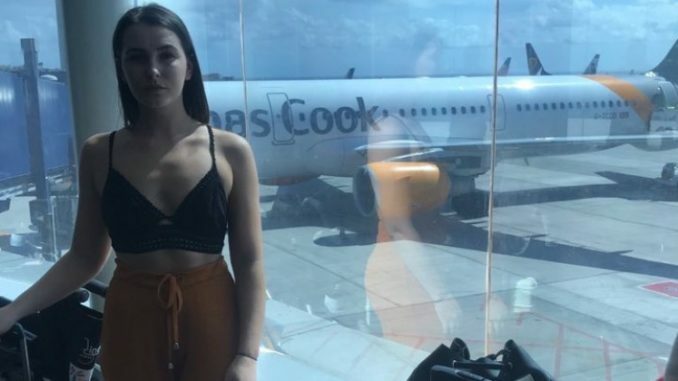 The woman successfully passed through airport security and passport control wearing the top, but what told to cover-up as soon as she boarded the plane. The staff said nothing to the man and immediately went to retrieve O’Connor’s bags to get her off the plane. “I was given a jacket by my cousin sitting at the front of the plane and they did not leave until I physically put it on. They made comments over the speaker about the situation and left me shaking and upset on my own,” O’Connor added. While it’s not known what triggered the attempt to remove the woman from the plane, some have suggested that elements of Birmingham’s “diverse” population may have been enforcing modesty culture. Muslims make up around 25% of the population of Birmingham, which is England’s second city after London. Birmingham is so “super diverse” that British white people are set to become a minority in the city by 2021, according to a recent study. A study last year found that almost 50,000 of the 1.1 million inhabitants of Birmingham cannot speak English. In 2017, there were a whopping 620 cases of female genital mutilation (FGM) just in Birmingham and surrounding environs. French Islamist are even moving to Birmingham so their wives can wear the full veil, which is banned in France. Birmingham airport also provides ‘Wudu’ rooms that are used for “ritual Islamic purification”.